Emanuel (Kaya Scodelario) has never been able to come to terms with her mother dying during childbirth. Her long-suffering father (Alfred Molina) and his new wife are at a loss as how to cope with the depressive and acerbic teen, especially as her upcoming birthday and the anniversary of her mother's death throws her into even deeper despair. A new neighbour, a beautiful young mother named Linda (Jessica Biel) – who looks remarkably like Emanuel’s dead mother – moves in next door with her new-born daughter Chloe. Seeking out a mother figure, having rejected her over-keen stepmother (Frances O’Connor), Emanuel immediately strikes up a bond with Linda. But their relationship becomes complicated by a strange secret that Linda harbours, which is about to be uncovered and change their lives permanently. 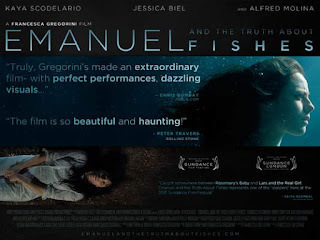 Balancing realism with surrealist vignettes, 'Emanuel And The Truth About Fishes' is visually stunning and full of noteworthy performances, especially from former 'Skins' actress Kaya Scodelario. Surprisingly it’s also Jessica Biel’s most accomplished work to date, and she anchors the film with her multi-layered and subtle performance of a fragile woman teetering on the brink. If there is one thing that jars about the film, it’s that it in parts it was too full of teen angst, especially in the off-putting opening voiceover from Emanuel. The dialogue of her moody and self-indulgent character makes her a wholly unsympathetic protagonist – obviously we’re meant to feel her pain, but she’s so consistently annoying and rude that it’s hard to really identify with her. This is further highlighted in her interactions with her love interest Claude (Aneurin Barnard) – their burgeoning train romance is initially the most charming part of the film, but then he too becomes just another recipient of Emanuel’s rages. The climax of the film is slightly ludicrous, but it’s intense and gripping nonetheless. Writer/director Francesca Gregorini’s offbeat screenplay is powerful and ambitious, shining a spotlight on complex female relationships and exploring the complicated notion of motherhood. It’s also full of unexpected twists and turns, deftly making the transition from gripping drama into a dramatic psychological thriller. 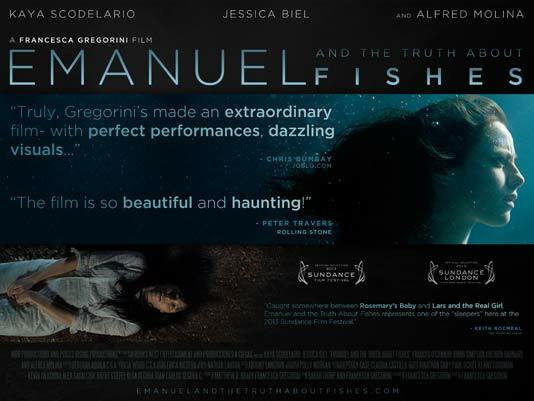 Although it’s not a pioneering, genre-busting piece of cinema, 'Emanuel And The Truth About Fishes' is a solid sophomore effort from Gregorini. It’s definitely worth a watch, especially for Jessica Biel and Kaya Scodelario’s skilful performances and it should do well on the indie film festival circuit. 'Emanuel And The Truth About Fishes' premiered at Sundance London festival 2013.